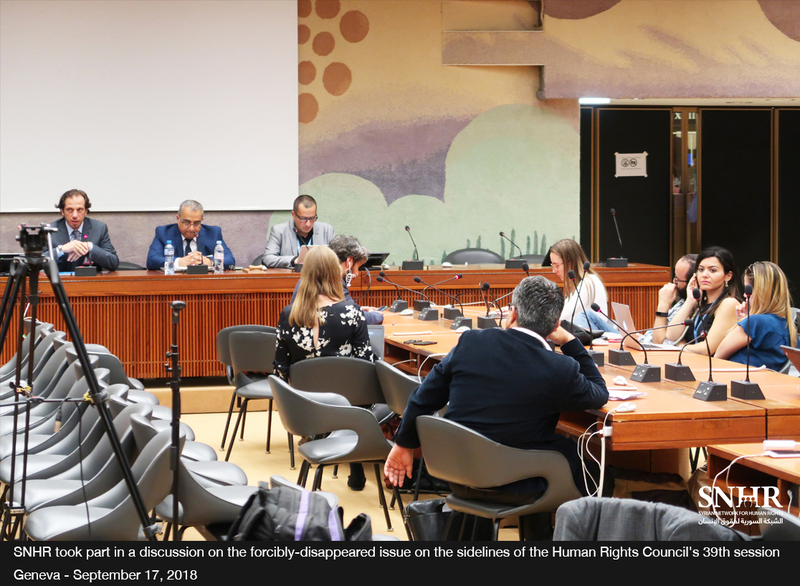 GENEVA – September 17, 2018: three Syrian groups, the Syrian Network for Human Rights (SNHR), the Syrian Center for Media and Freedom of Expression (SCM), and With Justice, organized a side-event at the Human Rights Council in Geneva. The event was held on the sidelines of the Human Rights Council’s 39th session which tackled the issue of the Syrian regime acknowledging that hundreds of forcibly-disappeared Syrian citizens had died, as a number of Syrian and international groups were in attendance, as well as the ambassador of Liechtenstein. SNHR has released two reports on this sensitive issue where the session was held to shed light on the issue of the Syrian regime revealing the fate of a number of forcibly-disappeared persons and registering them as dead in civil records which started to surface in April 2018. Moderated by Wael Sawwah, head of With Justice, the session started with Fadel Abdul Ghany, chairman of SNHR, who focused on three main points. Abdul Ghany noted firstly that the Syrian regime hasn’t spared any effort to arrest activists and residents since the very first weeks of the popular uprising, stressing that there are still around 127,000 detainees in the Syrian regime’s prisons and detention centers, including approximately 85,000 citizens who have become forcibly-disappeared. Those, Abdul Ghany added, are being subjected to extremely severe and sadistic torture methods. Abdul Ghany also noted that SNHR’s database contains the details of approximately 13,000 victims who died due to torture inside detention centers for the Syrian regime. He then proceeded to point out that the Syrian regime has revealed the fate of 836 cases through civil registry offices, stressing that revealing those deaths by the Syrian regime without specifying the cause of death or delivering dead bodies does not constitute a true revelation according to the international law. As such, the fate of those is still considered unknown. Moreover, Abdul Ghany raised the question that if the Syrian regime has always denied having forcibly-disappeared detainees, how could it know that they died?